The GPS receiver produces replicas of the C/A-code. Each PRN code is a noise-like, but predetermined, unique series of 1023 bits and different for each SV. The receiver produces the C/A- code sequence for a specific SV with an internal C/A code generator. The C/A-code generator repeats the same 1023-chip PRN-code sequence every millisecond. PRN- codes are pre-defined for 32 satellite identification numbers exceeding the minimum constellation of 24 satellites. Five (5) of the codes are reserved for use by pseudolites. Thus there are two sets of C/A-code signals. The set received from the satellite and the replica generated by the receiver. The receiver slides the replica of the code in time until there is correlation with the SV code (assuming the SV is in view based on a known last position, a stored almanac and/or initialisation by the user or e.g. the IRS position). If the receiver would apply a different PRN-code to a SV signal there is no correlation possible. When the receiver uses the same code as the SV and the codes begin to line up, some signal power is detected. As the SV and receiver codes line up completely full signal power is detected. The receiver uses the detected signal power in the correlated signal to align the C/A-code in the receiver with the code in the SV signal. A phase lock loop that can lock to either a positive or negative half cycle is used to demodulate the 50 Hz Navigation Message from the GPS carrier signal. The same loop can be used to measure and track the carrier frequency (Doppler shift) and by keeping track of the changes to the numerically controlled oscillator even carrier frequency phase can be tracked and measured. Note: the receiver in fact has two tracking loops to achieve lock on. The ‘carrier tracking loop’ is to track the carrier wave signal to measure the Doppler shift due to the relative movement between satellite and user. This loop adjusts the receiver oscillator. The code-tracking loop is to track the C/A code signal to derive the pseudo range. Both tracking loops need to achieve lock on to allow demodulation of the navigation message signal. The receiver PRN-code start position at the time of full correlation is the time of arrival (TAO) of the SV PRN at the receiver. This TOA is a measure of the range to SV offset by the amount to which the receiver clock is offset from GPS-time. This TOA is converted into the pseudo range. The position of the receiver is where the pseudo ranges from a set of SV’s intersect. The pseudo range measurements are used together with SV position estimates based on the precise orbital elements (ephemeris data) sent by each SV. This orbital data allows the receiver to compute the SV positions in three dimensions at the instant that they sent their respective signals. Four satellites (normal navigation) can be used to determine three position dimensions and time. Position dimensions are computed by the receiver in Earth-Centred, Earth-Fixed (ECEF) X, Y, Z, co-ordinates. Time is used to correct the offset in the receiver clock, allowing the use of an inexpensive quartz clock in the receiver. Receiver position is computed from the SV positions, the measured pseudo ranges (corrected for SV clock offsets), ionosphere delays, and relativistic effects, and a receiver position estimate (usually the last computed receiver position). Three Satellites could be used to determine three position dimensions with a perfect receiver clock. In practice this is rarely possible and three SV’s are used to compute 2-dimensional, horizontal fix (in latitude and longitude) given an assumed height. This is often possible at sea or in altimeter equipped aircraft. Five or more satellites can provide position, time and redundancy. More SV’s can provide extra position fix certainty and can allow detection of out-of-tolerance signals under certain circumstances. Position in XYZ is converted within the receiver to geodetic latitude, longitude and height above the ellipsoid. Latitude and longitude are usually provided in the geodetic datum on which GPS is based (WGS-84). Receivers can often be set to convert to other user-required data. Position offsets up to 1000 meters can result from using the wrong datum. Velocity is computed from change in position over time, the SV Doppler frequencies, or both. Time is computed in SV Time, GPS Time, and UTC. SV Time is the time maintained by each satellite. Each SV contains multiple atomic clocks. SV clocks are monitored by ground control stations and occasionally reset to maintain time to within one-millisecond of GPS time. Clock correction data bits reflect the offset of each SV from GPS time. SV-Time is converted to GPS-Time in the receiver. GPS-Time is a “paper clock” ensemble of the Master Control Clock and the SV clocks. GPS-Time is measured in weeks and seconds from 24:00:00, January 5, 1980 and is steered to within one microsecond of UTC. GPS-Time has no leap seconds, like UTC has, and is ahead of UTC by several seconds. NOTE: the GPS 10-bit week counter resets to zero (0) 1024 weeks after above date and time, this happens August 21, 1999 for the first time and may affect some GPS receivers in use. UTC-Time is computed from GPS-Time using the UTC correction parameters sent as part of the navigation data bits. GPS-Time is now (at time of writing) ahead of UTC by 13 seconds. − Warming up to stabilize circuits. − Initial position and time known to better estimate pseudo ranges expected. − Recent almanac available in memory to estimate satellites in view (up to 180 days valid). − Ephemerides still available to speed up lock on (up to 4 hours valid). − Unobstructed view on satellites for maximum signal strength and low DOP. Carrier-phase tracking of GPS signals has resulted in a revolution in land surveying. A line of sight along the ground is no longer necessary and positions can be measured up to 30km from reference point without intermediate points. This use of GPS requires special carrier tracking receivers. The L1 and/or L2 carrier waves are used. The wavelength of L1 is 19cm. This allows range measurements to a fraction of a wavelength with relative accuracies of mm under special circumstances. Tracking carrier phase signals provides no time of transmission information. The carrier signals carry no time-tags that distinguish one cycle from another. At least two receivers track the carrier signals at the same time. Ionosphere delay differences must be small enough to insure that carrier phase cycles are properly accounted for. This requires that the two receivers be within 30km of each other. All carrier-phase tracking is differential, requiring both a reference and remote receiver tracking carrier phases at the same time. Unless the reference and remote receivers use L1-L2 differences to measure the ionosphere delay, they must be close enough to insure that ionosphere delay difference is less than a carrier wave length. Using L1-L2 ionosphere measurements and long measurement averaging periods, relative positions of fixed sites can be determined over baselines of hundreds of km’s. Problems result from the difficulty of tracking carrier signals in noise or while the receiver moves. Post processed static carrier-phase surveying can provide 1cm – 5cm relative positioning within 30km of the reference receiver with measurement time of 15 minutes for short baselines (10km) and one hour for long baselines (30km). Rapid static or fast static surveying can provide 4-10cm accuracies with 1km baselines and 15 minutes of recording time. Real-Time-Kinematic (RTK) surveying techniques can provide centimetre measurements in real time over 10km baselines tracking 5 or more satellites and real time radio links between the reference and remote receivers. So far carrier phase tracking techniques are not considered for use in aviation. * Bias errors result from SA (Selective Availability) and other factors. SA is the intentional degradation of the GPS signals by a time varying bias. SA is controlled by the DoD to limit accuracy for non-US military and government users. The potential accuracy of the C/A-code of around 30 meters is reduced to 100 meters (95%). The SA bias on each satellite is different, and so the resulting position solution is a function of the combined SA bias from each SV used in the navigation solution. Because SA is a changing bias with low frequency terms in excess of a few hours, position solutions or individual SV pseudo-ranges cannot be averaged over periods shorter than a few hours. Lack of inherent integrity has been mentioned before. GPS involves substantial number crunching by computer software on the ground, in space and in the air. Although the use and output of the GPS receiver seems extremely easy, the user should be aware that the GPS does not provide an immediate alert if anything goes totally wrong. GPS ranging errors are magnified by the range vector properties. The volume of the shape described by the unit vectors from the receiver to the SV’s used in a position fix. Poor GDOP results when angles from receiver to the set of SV’s used are similar. Good GDOP results when angles from receiver to the set of SV’s used are different. 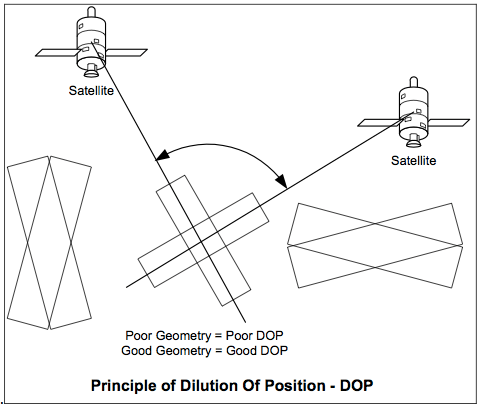 GDOP is computed from the geometric relationships between the receiver position and the positions of the satellites the receiver is using for navigation. For planning purposes GDOP is often computed from Almanacs and an estimated position. Estimated GDOP, however, does not take into account obstacles that actually may block the line-of-sight from the position to the satellites. Bad satellite visibility may result in the receiver using another set of satellites as planned. The receiver computes GDOP terms using parameters from the navigation solution process. − PDOP = Position Dilution of Precision (3-D), sometimes called the Spherical DOP. − HDOP = Horizontal Dilution of Precision (latitude, Longitude). − VDOP = Vertical Dilution of Precision (Height). − TDOP = Time Dilution of Position (Time). While each of these GDOP terms can be individually computed, they are not independent of each other. A high TDOP will cause receiver clock errors which will eventually result in increased position errors. Errors multiplied by DOP determine the accuracy of the position and time information provided by the GPS system. The SPS in general results in acceptable accuracies of 100 meters however the integrity of the results and the accuracy’s are too low for all navigational needs. Too improve in both fields augmentations have been developed.